The beauty of the GrimmSpeed Staged Power Packages is that all of the included components were designed and tested to work well together, as a complete system. 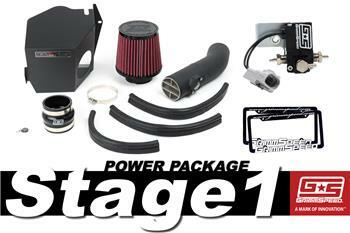 Instead of piecing together parts from many different manufacturers and hoping that they’re design theories are compatible, consider starting with one of our excellent Staged Power Packages based on your goals! The GrimmSpeed Stage 1 Power Package is an excellent place to start when modifying your car. The upgraded GrimmSpeed 3-Port Boost Control Solenoid offers more accurate and more responsive boost control and is a must when having your vehicle professionally tuned. The GrimmSpeed Intake adds an additional performance increase by reducing pre-turbo restriction, which allows your turbo to build boost more quickly and more efficiently. With the GrimmSpeed Stage 1 Power Package and a tune, expect to see a decrease in time to spool, rock solid boost control and an increase in torque and horsepower, The Electronic Boost Control Solenoid keeps boost in the system instead of bleeding it away like the factory configuration. This, coupled with its extremely fast and precise response, makes for an invaluable tool for tuning your boost curve. The Cold Air Intake decreases restriction before the turbo’s compressor. This decrease in restriction increases compressor efficiency, which builds boost pressure faster and higher.